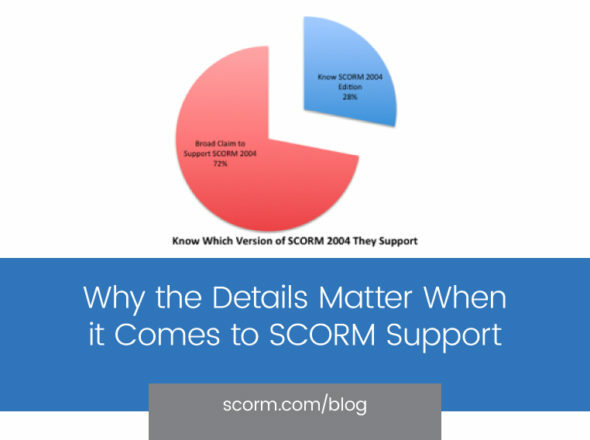 When I last reviewed our SCORM Cloud stats, I noticed just how closely the actual use of different standards mapped to the claimed support. Obviously SCORM 1.2 is the most popular and has nearly identical use in our SCORM Cloud. However, many may claim to support SCORM 2004 4th edition, but few actually generate courses using it. I realize SCORM 2004 isn’t always easy and it can create some confusion, could this be the reason for the difference? Maybe the 3rd edition was widely implemented and some became weary of another upgrade. It’s also possible that some of the 4th edition experts out there have no need to test content on SCORM Cloud. I’ll continue to pick at this, but the exact answer is unknown to me. Whatever the reason for 4th’s variance, it’s comforting to know that the standards we mapped in the eLearning Atlas closely match the real-world behavior in the SCORM Cloud. As we continue to develop both tools, what other correlations or discrepancies do you expect to find?